She writes: “The rise of President Jair Bolsonaro of Brazil has put the environment and human rights in peril. His promises to open the Amazon for business could result in huge deforestation and the release of vast greenhouse-gas emissions. His threats to slash fundamental environmental and indigenous rights standards that help keep the Amazon standing are a threat to climate stability. “Mr. Bolsonaro, however, wouldn’t be the only one to blame for devastating the Amazon. Companies that accept his invitation to reap profit from Amazon destruction, and the financial institutions that provide the capital, will also bear great responsibility. And those poised to benefit from Mr. Bolsonaro’s reckless policies include American companies and financial institutions. “Two of the largest publicly traded agribusiness firms operating in the Brazilian Amazon — Archer Daniels Midland and Bunge — are American-based companies. 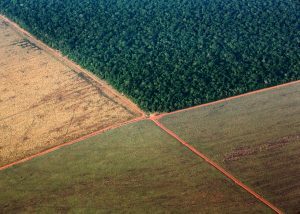 Agribusiness, in particular soy and beef production, is a leading driver of forest loss and human-rights abuses in the Brazilian Amazon, and A.D.M. and Bunge are two of the largest soy traders in Brazil. As producers seek more and more land for growing crops and grazing cattle, they push ever deeper into the Amazon. According to a report published in 2014, an estimated 90 percent of deforestation in the Brazilian Amazon is due to agribusiness activities. “Where would these powerful agribusiness companies get the capital they need to bulldoze deeper into the Amazon, if they should take Mr. Bolsonaro up on his offer to eliminate environmental protections?